Back in 2008, Bowers & Wilkins (B&W) entered the iPod-speaker market with a bang with the $600 Zeppelin ( ), a high-end speaker dock that combined excellent sound quality, some unique technical features, and B&W style. It was a bold product statement, and it served the company well—the Zeppelin has been a flagship product on Apple Store shelves, has earned widespread praise, and opened the doors for other Apple-focused products, such as the P5 Mobile Hi-Fi Headphones ( ) and MM-1 computer speakers ( ). The company even offers a compact version of the Zeppelin, the Zeppelin Mini. B&W has since added to its Apple-focused portfolio—and achieved another milestone—by being the first company to ship an AirPlay-enabled audio system, the Zeppelin Air. The most obvious improvement the Zeppelin Air offers over the original is the capability to play audio streamed wirelessly from your computer or iOS device via Apple’s AirPlay technology, but B&W has also upgraded the Zeppelin in a number of other significant ways. At first glance, the Zeppelin Air looks almost identical to the original Zeppelin. You get the same pill- (or, if you will, dirigible-) shaped enclosure—approximately 25 inches wide, 7.5 inches high, and 8 inches deep—with the entire front covered in black mesh. However, whereas the back of the original Zeppelin was metal with a chrome finish, the back of the Zeppelin Air is made of glossy-black, glass-fiber-filled ABS plastic that the company says is considerably more rigid for better audio performance. (I’m guessing the plastic also offers better wireless performance.) At the top of the unit, dead-center, are volume buttons and a standby/input-select button. The front of the Air sports the Zeppelin line’s unique, curved dock-connector cradle—still my favorite of all the docking speakers I’ve tested because of the way it lets you wrap your entire hand around the cradle while accessing your player’s controls. This, too, has been improved slightly, using what appears to be a sturdier spring-loaded mechanism for accommodating thinner and thicker devices. While the cradle doesn’t support an iPad, it works with all iPhone, iPod touch, and iPod classic models, along with 2nd-generation-and-later iPod nano models. The cradle charges your iPhone or iPod and, if you connect the Zeppelin to your computer using the Zeppelin’s USB port, you can sync your iPhone or iPod with iTunes. As with the original Zeppelin, the Air is meant to sit in one place. It’s not difficult to move—it uses an internal power supply, so the only cable is a simple power cable—but it’s heavy enough and bulky enough that you won’t be carrying it from place to place regularly. For those times you do need to move the system, a welcome change is that the original Zeppelin’s clumsy stand design—two different rubber bases that allowed for different angles but that fell off if you picked up the system—has been upgraded to a single, stiffer-rubber base that’s attached with screws. The Zeppelin Air includes the same beautiful, pebble-shaped remote control as the Zeppelin, sporting the same glossy-black front, chrome back, and rubber “foot.” The remote provides basic controls—standby (power), previous, play/pause, next, volume up, and volume down—along with a button to switch between the Air’s four possible inputs: AirPlay, dock, USB, or aux-in. The buttons are laid out in an intuitive pattern, making the remote easy to use by feel, and B&W has fixed my biggest complaint with the original version: While it still uses a symmetrical shape with a symmetrical button layout, the remote has gained a subtle indentation on the bottom that falls perfectly under your index finger when you hold the remote in the proper orientation. Kudos. Like the original Zeppelin, the Air includes a built-in digital-to-analog converter (DAC). However, the Air’s DAC has been upgraded to 24bit-96KHz capability, and all inputs are fed into this DAC—even the analog input—where they’re upsampled and processed. The company says this significantly improves audio performance. There are other big changes inside, as well. While the Zeppelin Air uses the same five-inch woofer as before, the Zeppelin’s left and right drivers—a 3-inch midrange driver and a 1-inch tweeter on each side—have been upgraded, and each of the five drivers now gets its own Class-D amplifier. These five amplifiers provide a total of 150 Watts of power—50 Watts for the woofer and 25 Watts for each of the other four drivers. And to improve bass response and overall audio performance, B&W has improved the bass-port design and implemented the company’s Dynamic EQ technology (which also protects the amplifiers from overloading at high volumes). The Zeppelin Air is also officially Made-for-iPhone certified. The Zeppelin Air still works great as an iPod dock, and it sports similar iPod/iPhone-playback features as its predecessor. For example, a docked iPhone or iPod touch gains a new Speakers screen in the Settings app (traditional iPods gain a Speakers menu) for adjusting the Zeppelin Air’s bass level—a welcome option, as the Zeppelin Air’s increased bass output can be a bit overwhelming if the system is positioned close to a rear wall. 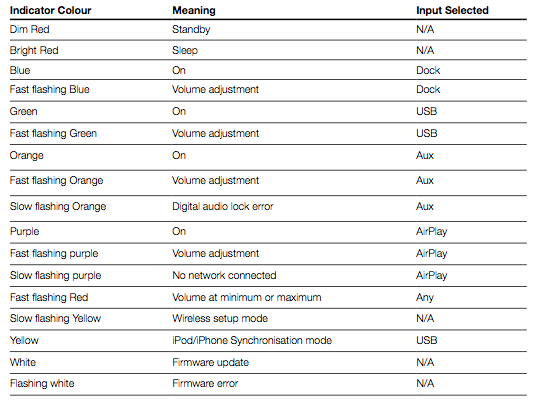 On non-touch iPods, a new Backlight setting lets you choose whether the iPod’s screen is always lit, lit only when playing, lit only when the controls are accessed, or never lit. But, of course, the big addition here is AirPlay support. Once the Zeppelin Air is connected to your AirPort Wi-Fi network—it must be a Wi-Fi network provided by an Apple AirPort Extreme or Express Base Station—the unit appears as an AirPlay destination in iTunes on your Mac and in any AirPlay-compatible app on iOS devices, letting you stream audio wirelessly. Similarly, to stream audio from an iPad, iPhone, or iPod touch, you just click the AirPlay button from within any AirPlay-compatible app and choose the Zeppelin Air as the destination. Whether streaming from iTunes or an iOS device, there’s a slight delay when you first switch to an AirPlay destination, but after that, playback is smooth—in using the Zeppelin Air for several weeks, there was only one time I experienced dropouts or stuttering, and other devices on my wireless network were also having problems that day. (Of course, if your Wi-Fi network isn't solid, your experience may not be as good as mine—AirPlay is only as good as your wireless network.) I even watched an entire episode of The Wire on my iPad, with the audio streamed to the Zeppelin Air, without the audio and video getting out of sync. AirPlay streams audio in Apple Lossless format, so you don’t lose fidelity by listening wirelessly—music sounds as good as the original files, be they low bit-rate MP3s and AACs or uncompressed AIFF files. B&W got the little details right here, as well. Rather than a traditional “off” mode, the Zeppelin Air has sleep and standby modes. Sleep mode (activated by pressing the standby button on the remote or by holding down the standby/input button on the main unit for two seconds), powers down most of the Zeppelin’s electronics but keeps its wireless connection alive so the Air remains available as an AirPlay destination. If you send audio to the Zeppelin Air, it immediately wakes up—a great feature that makes AirPlay far more convenient than if you had to remember to turn on the Zeppelin first. Standby mode (activated by holding down the main standby/input button for four seconds), on the other hand, shuts down all of the system’s electronics except the remote sensor, using less power but requiring you to manually wake up the Zeppelin Air when you want to use it. How much energy do you save? In my testing, The Zeppelin Air drew approximately 6 Watts of power in sleep mode, but less than 1 Watt in standby mode. Another nice feature is that when streaming from iTunes, you can use the Zeppelin’s remote to control iTunes playback: play, pause, previous, or next track. (This feature requires that iTunes’ Allow iTunes Control From Remote Speakers option, in iTunes’ preferences, be enabled.) 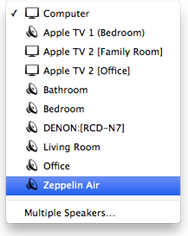 Similarly, when streaming audio from an iOS device, the Zeppelin Air’s remote can control iOS playback. The Zeppelin Air is also smart enough to not let you switch input sources if only one source is available. For example, if there’s no iPhone or iPod in the dock cradle, and no audio source connected to the auxiliary-input jack or USB port, you can’t accidentally switch the source away from AirPlay. Finally, as mentioned above, the Zeppelin can also be used as a USB speaker system for your computer; when doing so, the Zeppelin’s volume buttons control your computer’s volume level. One potentially confusing thing here is that the Zeppelin doesn’t identify itself to your computer as a USB-audio device until you switch the Zeppelin’s input to USB, and when you switch away from USB, the Zeppelin disables the USB-audio connection altogether—which means the Zeppelin disappears as far as your computer is concerned. At least on a Mac, however, once you’ve initially connected the Zeppelin and selected it as your audio output, the Mac automatically switches to the Zeppelin whenever it's connected. With all these ways other than a docked iPhone or iPod to get audio to the Zeppelin Air, you may be thinking it would be nice if B&W offered a cradle-less version. The company told Macworld that if the cradle and arm really bother you, you can actually remove the entire apparatus, although doing so will void your warranty. As with its predecessor, the Zeppelin Air sounds more like a small home stereo than a desktop iPod dock, offering outstanding audio quality that’s rich and full. Thanks in part to the Zeppelin’s wide profile, stereo separation remains better than with many one-piece systems, although it’s still not as good as you’d get with a system with separate left and right speakers positioned farther apart. But the Zeppelin Air offers minor but welcome improvements over the original thanks to its new components and tweaked design. The most obvious upgrades are in bass response and maximum output. The Zeppelin Air’s low-frequency output is noticeably more powerful than that of the orignal Zeppelin, and it’s as good as that of any desktop system we’ve tested. You won’t get the lowest frequencies—the woofer is simply too small—but the Zeppelin offers relatively flat bass response down to around 75Hz or 80Hz, and decent performance as low as 60Hz to 65Hz. Bass is powerful without being boomy (unless, as with any system, you place the Zeppelin too close to a wall or corner), and low frequencies are clear and distinct.